US President and PM Netanyahu give joint press conference before first meeting since Trump's inauguration. Prime Minister Binyamin Netanyahu arrived at the White House at approximately 12:00 p.m. Eastern standard time. The Prime Minister and US President Donald Trump held a joint press conference shortly before their first official meeting since President Trump took office last month. President Trump began the press conference by speaking about the Iranian threat. "One of the worst deals I've ever seen is the Iran deal. My administration has already imposed new sanctions on Iran, and I will do more to prevent Iran from ever developing, I mean ever, a nuclear weapon." He praised the US military assistance to Israel as necessary. Speaking about the peace process, Trump said: "It is the parties themselves who must directly negotiate such an agreement," and that both sides would have make compromises to achieve peace. 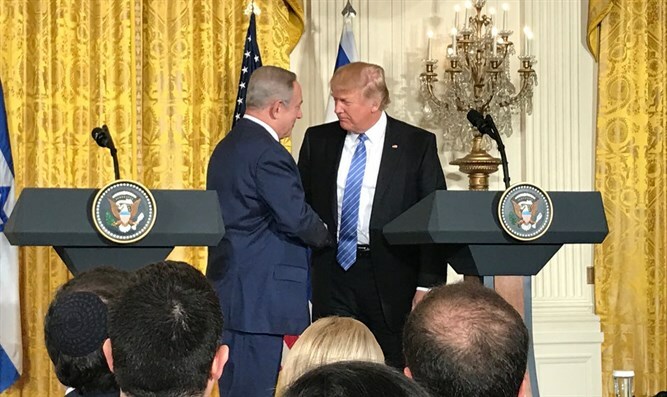 Trump did not commit to the two state solution, saying that he would be happy with any agreement Israel and the PA reach. "I'm looking at two-state and one-state, and I like the one that both parties like. I'm very happy with the one that both parties like. I can live with either one." Addressing construction in Judea and Samaria, he told Netanyahu, "I'd like to see you hold back on settlements a little bit." Prime Minister Netanyahu attacked the PA for its incitement, the salaries it pays to the murderers of Israelis and even Americans, and its denial of Jewish history and Jewish rights. "If anyone believes that I, as the Prime Minister of Israel, [who is] responsible for the security of my country, would blindly walk into a Palestinian terrorist state, which seeks the destruction of my country, they are gravely mistaken." Netanyahu said that the Jews are native to the land of Israel. "Why are Jews called Jews? The Chinese are called Chinese because they come from China. The Japanese are called Japanese because they come from Japan. Well, Jews are called Jews because they come from Judea. This is our ancestral homeland." Netanyahu brought up the idea of a larger regional agreement between Israel and the Arab nations. Trump called the idea "a terrific thing." Trump agreed with Netanyahu about the incitement in the PA, and called on the PA to recognize Israel.